The total number of U.S. passports issued in Fiscal Year 2013 shows an increase of more than 400,000 over the previous year, which was up more than 500,000 from 2011. Although the numbers are still far less than before the economic recession, they are gradually increasing as the economy improves. In 2007, implementation of the Western Hemisphere Travel Initiative Act demanded anyone entering the U. S. by air from Canada, Mexico and the Caribbean must show a valid passport. This was a change from the previous practice, and the total number of passports issued, and applied for, spiked in that year. The effects of the economic recession began to be felt in 2008, with a concurrent decline in both the number of applications and the number of passports issued. 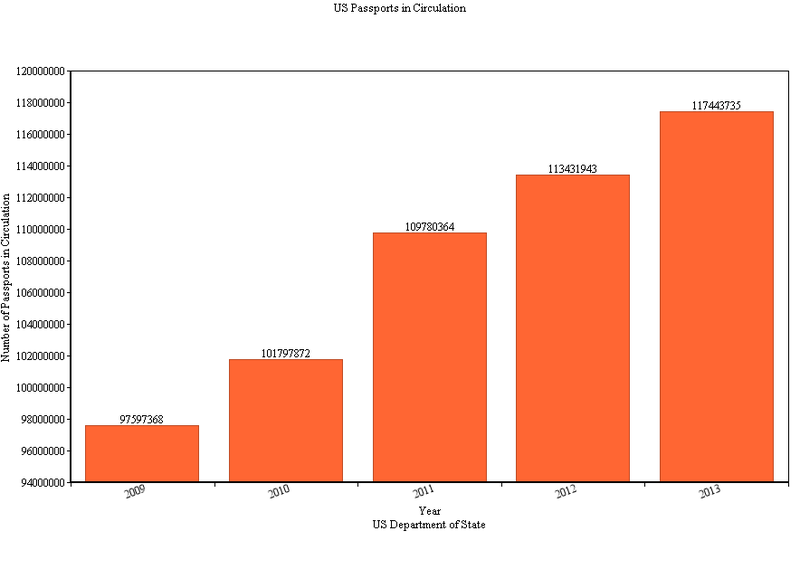 Click here For a complete view of the latest US Passport Statistics. In June of 2009, the second phase of the Travel Initiative Act was implemented, and travel to or from Canada, Mexico and the Caribbean by land or sea required a passport, a passport card or another Department of Homeland Security approved identification. After a precipitous annual decline from 2007 to 2008 to 2009, the number of passports issued in 2010 increased by more than 600,000, fueled by demand from land and sea travelers to those areas. After that rush, both the number of applications and the number of passports issued took another steep drop in 2011, before beginning a gradual increase in the past two fiscal years as the overall economy picks up. However, although passports, or passport equivalents, are needed for many more travel options than in 2007, the statistics for 2013 show that there is a long way to go to reach the previous levels. One of those passport equivalents is a passport card, which the U.S Government began to issue in June, 2008. Not legal for international air travel, it is valid for land and sea travel between countries and is a cheaper, smaller and, for some, more convenient alternative. In 2009, the first full year passport cards were in use, they represented 10.9% of the total number of passports issued; in 2010, they were 10.5%. In each of the next two years, the number of passport cards were less than 10% of the total issued. In 2013, that number rebounded to 10.4%, indicating more travel in North America by land and by sea. This figure bodes especially well for future North American travel. While overall it increased by 1% from 2012 to 2013, additional demand for passport cards, which facilitate cheaper land travel to Canada, Mexico and the Caribbean, foreshadows greater travel to those areas. Future travel plans to other areas are also hinted at in the 2013 statistics. Foreign travel increased by 2% from 2012 to 2013, while the number of passports issued went up by 2.4%. If the economy continues to improve, there is more good news in the statistics for the travel industry. Despite the general suppression in the number of passports issued and applied for in the past few years, because passports are valid for ten years, the number of passports in circulation has been steadily increasing. With more passports in circulation, more foreign travel of all kinds is easier for more people. The 2013 number shows that more than one-third of the U.S. population holds a valid passport. This figure is not surprising since there are an increasing number of uses for passports or passport equivalents. The Real ID Act of 2005 has requirements for state drivers’ licenses, which will eventually be necessary as identification to enter federal buildings or to travel on federally regulated commercial aircraft. Without state compliance with these regulations, residents of the non-compliant states may conceivably be required to show a passport even for domestic air travel. Implementation of the Real ID Act has been deferred several times, as the Department of Homeland Security hoped more states would come into compliance. As of February, 2014, the Department has declared that 14 states and territories are non-compliant. There are an additional 21 states and territories that have extensions, currently set to expire in October, 2014, in order to comply. Only 21 states have drivers’ licenses that are in compliance with the Act as of February, 2014.